The surgeries will be closed on Good Friday (19th April) and Easter Monday (22nd April), reopening as usual on Tuesday 23rd April. Dr Martin Searle has retired. Dr Searle has decided to hang up his stethoscope as a salaried GP but will be returning as a locum from time to time. Dr Searle has been with Patford House Surgery for six years and as you will all agree he has been a fab GP. We look forward to seeing Dr Searle at Patford soon. Wiltshire Clinical Commissioning Group in conjunction with local GPs has developed a new website – www.diabeteswellbeing.org - specifically aimed at providing support and advice for 23,500 people currently living with Type 2 diabetes in Wiltshire. After a successful application to Wiltshire CCG, Beversbrook Medical Centre and Patford House Surgery (including Sutton Benger Surgery) will be merging on 1st April 2019. The Partners and staff of the surgeries are excited about the merge and optimistic about the possibilities this will bring to improve our services and level of care for our patients. Both Patford House Partnership (PHP) and Beversbrook Medical Centre (BMC) have GP Partnership vacancies which have been open for some time. It has been difficult to recruit new GPs in the current climate, leaving both PHP and BMC with vulnerable Partnership models. Small partnerships carry much more responsibility – for instance if something happens to one out of two partners, the practice becomes incredibly vulnerable. Larger partnerships are able to share the responsibility more fairly, spreading the risk. By merging, we are able to strengthen our Partnership to a more resilient number and hopefully attract more GPs to join us. Will you be moving in together into one building? Patients will not be expected to move Surgeries as we will retain the three separate buildings, which will continue to serve their patient populations as they are presently. Patford House Surgery has been looking to move to a new building for some time – the current building in Patford Street, which is listed, is lovely but really isn’t suitable anymore, so we still plan to move to a building which is fit for purpose. Our Sutton Benger practice will remain where it is, as will Beversbrook Medical Centre. Will we change our name? Each of our Surgeries has a deep heritage and culture behind their Surgery names, this is important to us and we are proud to be serving the residents of Calne. We feel that each Surgery offers the best service they possibly can to their patients. We hope our patients won’t see any change to the usual day to day care we each provide and this includes the name of their Surgery. Each Surgery will continue as it is – as Beversbrook Medical Centre, Patford House Surgery and Sutton Benger Surgery. Sadly, we can’t stay in our Patford House building and would like to give our new building a new name when the time comes, but we really want to retain our Calne heritage, so we are going to call our new partnership Patford House Partnership. How will the proposed merger benefit patients of each practice? We would love to hear your comments and questions. Please contact us through infopatfordhouse.partnership@nhs.net. Improved Access is a Wiltshire-wide initiative where local practise are working together to offer increased availability of services and appointments in the evenings and the weekend. These appointments are available 18:30-20:00 Monday-Friday, and Saturdays, Sundays and bank holidays. This collaboration by practices will ensure patients in Wiltshire have this option, but this might mean you will be offered an appointment at another practice. Appointment types will vary- some being face-to-face, some on the phone - and there will be a mixture of bookable and same-day appointments available across the week. We will be offering appointments with GPs as well as with other healthcare professionals, such as a Practice Nurse or Health Care Assistant. We are keen to balance the importance of continuity of care with convenient access for patients, while ensuring that the service is safe. Wiltshire CCG has issued guidance for enjoying the sunny weather safely. To make the most of the summer weather, have a look at the their recommendations. Winter can be challenging and as the days get colder and bugs and illnesses become more common, it’s important to take care of your health. 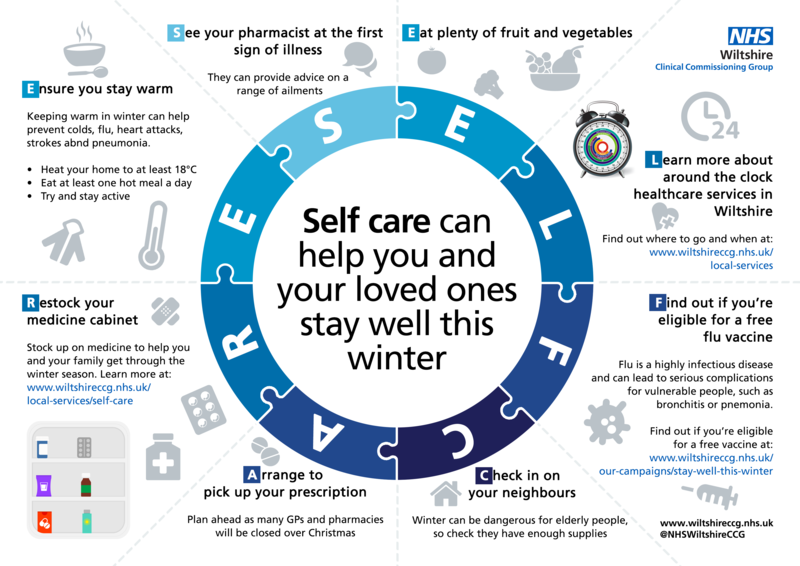 Wiltshire CCG has put together lots of advice and tips to help you stay well this winter. Read more here. Flu jabs are important for pregnant women to help protect their unborn babies. Read more information here. Please contact reception for an appointment. We now have a new information leaflet explaining your options with regard sharing your medical record. If you wish to change your preferences, please print this out and hand it in to reception. The leaflet is available here. Men in Wiltshire who spend a lot of time outside are being urged to 'Cover up mate' this summer to protect their skin and reduce the risk of developing skin cancer. Read more here. Wiltshire Clinical Commissioning Group is supporting the national Be Clear on Cancer campaign and encouraging local people, particularly the over 50s, to recognise respiratory symptoms and get the appropriate help where needed. A persistent cough or inappropriate breathlessness during everyday activities could be symptoms of a variety of conditions including cancer, chronic obstructive pulmonary disease and, in the case of breathlessness, heart disease. Diagnosing these conditions at an early stage makes them more amenable to treatment. Those who have a persistent cough lasting more than three weeks, or are experiencing breathlessness when completing everyday tasks, are encouraged to make an appointment with their GP, as they may be exhibiting the early signs of lung disease, including cancer. Across England, around 37,600 people are diagnosed with lung cancer each year and in Wiltshire during 2015, there were 282 people diagnosed with the condition. To help you make the right decision about where to get healthcare advice this summer Wiltshire CCG has put together a Healthcare Clock to signpost you to the most appropriate NHS service. We are delighted to announce that Patford House Partnership has been awarded 'GP Practice Placement of the Year' by Oxford Brookes University Faculty of Health and Life Sciences. The award aims to promote and reward excellent practice in placements and learning environments and is the result of our student nurse Sian Taylor nominating the nursing team here at Patford. We wish her all the best for her future career in nursing and well done to our fantastic nursing team! Read the latest issue of our newletter here. Doctorlink is a new tool designed to enable patients to get easy, quick healthcare advice 24/7 using an online tool to answer a series of medical questions. You can then receive medical advice tailed to you and your condition - and if you are recommended to see a GP, you can also request this through the online tool and a message is sent to us direct at the surgery. 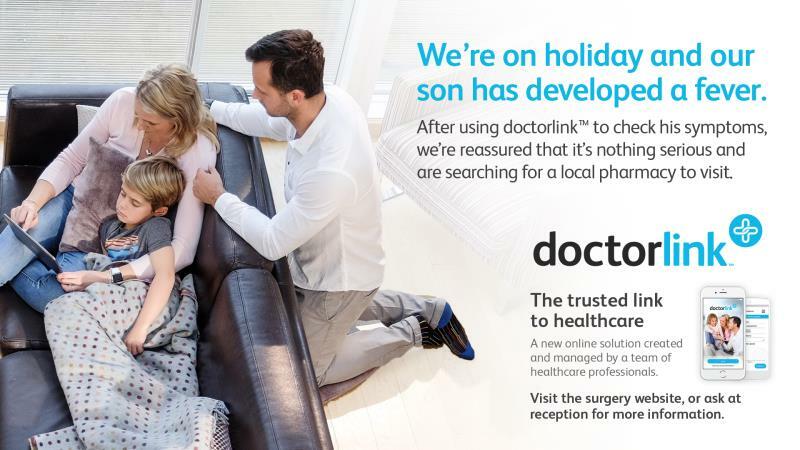 Doctorlink can be accessed here. Patients can now self-refer for physiotherapy treatment rather than wait for their GP to refer them. If you think you would benefit from physiotherapy, please complete the self-referral form and forward to the Physiotherapy Dept at Chippenham Hospital. More information is available here. See the latest guidance from NHS Wiltshire here including medication advice and ways to reduce symptoms. You can now choose to have additional information in your Summary Care Record including your illnesses, health problems, operations, vaccinations etc. For more information about the changes follow this here and the consent form is available here. If you have any questions, please contact the surgery. Wondering Whether Your Child Needs To See A Doctor? The booklet When Should I Worry is designed for parents whose children are suffering from coughs, colds, earache or sore throat. It guides parents to seek advice from the most appropriate source when their children are unwell. Between July and November 2016, over 31,000 GP, nurse and healthcare assistant appointments were missed across Wiltshire's 55 GP practices - the equivalent of over 1033 days of General Practitioner time. Read more here. Between 31 December 2016 and 8 January 2017, just over 5000 people attended A&E departments at RUH Bath and GWH Swindon and Salisbury District Hospital, yet only 33% of those people actually needed urgent or emergency treatment. Over the last month, people have attended A&E departments with minor ailments which are not serious or life-threatening including coughs, colds, sore throats, toothache, sickness, diarrhoea, backache and broken finger nails. Further information and advice on seeking help for non-urgent conditions can be found here. Think you may have norovirus? Symptoms include forceful vomiting, watery diarrhoea and sometimes raised temperature, headaches, stomach cramps and/or aching limbs. It is important that people suffering with norovirus do not visit hospitals, care homes or GP surgeries to prevent it spreading within the community. Usually symptoms settle after a couple of days and no treatment is needed, but if you are concerned please phone the surgery for advice. See more here. If you no longer need your appointment at Patford or Sutton Benger, please contact us in good time to let us know. If fewer appointments are wasted, this will mean shorter waiting times for those who need to see our clinicians. A booklet is available here with information on support available in Wiltshire for children and young peoople's wellbeing and mental health. Read our new newsletter here. As previously announced, our CQC inspection on 14th April resulted in Patford receiving an over rating of 'Good'. The NHS recommends that all babies and children receive a full course of vaccinations through their childhood. Please have a look at the NHS vaccination schedule to see if your child it up to date. If you think that your child may have missed any of these vaccinations, it isn't too late to book an appointment. Please contact reception to arrange an appointment with the practice nurse. Despite efforts to recruit patients to our PPG, we are still keen to hear from any patients who would be interested in joining. We would ideally like representation from all age groups (age 16 onwards). If you wold like to find out more, please contact the Practice Manager on wccg.patfordhouse-surgery@nhs.net. Kooth.com is a website offering free, confidential online support for teenagers. Users can remain anonymous if they wish and qualified counsellors are available daily - see our 'Clinics & Services' tab for more information. We are delighted to announce that following our routine inspection by the Care Quality Commission in April, we have been rated as 'Good' in all areas. To read the full inspection report, please follow the link on our homepage. Thank you to all staff and patients who helped us achieve this great result. A new website Wessex Healthier Together has been launched to help guide parents on when and where to seek help for children health issues. Patford House Surgery is now open from 0830 - 1800 and is no longer closed for lunch. This is in response from feedback from patients. A dedicated health trainer can assist you every step of the way to achieving and maintaining your goals. They can also help you find other services and activities. This service is for people aged 18+ and is free. The surgery is required by the Government, under the terms of the latest GP contract, to allocate all patients a named accountable GP who will be responsible for patients' overall care at the practice. If you wish to know who your accountable GP is, please ask at your next visit to the surgery. This may not be your usual GP and you are still able to book an appointment to see any GP in the practice. However, your named accountable GP will be responsible for the coordination of all appropriate services required under the contract and ensure they are delivered to each patient where required. If you require more information, please contact the surgery. We are now able to offer patients access to their medical record online. This means that in addition to summary information (allergies, adverse reactions & medication) patients can see all read codes entered into their electronic patient record since 1st December 2015. If you would like access to this functionality, bring in some photo ID to reception (if you already have online services access for appointment booking and/or repeat prescriptions) or complete an application for online services form (on our homepage) if you do not currently have access to our online services. If your child is eligible and you would like them to receive a flu vaccination, please contact reception. Please check here to see if your child is eligible. This year we will not be sending out invitation letters, so please check here to see if you are eligible for a flu vaccination. All over 65s, those with certain medical conditions, pregnant women and carers are all recommended to have the vaccination. Please contact reception to make an appt. The council has now painted yellow lines along Patford Street. This has had an impact on parking so please try to avoid bringing a car to the surgery unless absolutely necessary. Thank you for your cooperation.